Bone remodelling is dependent on the balance between bone resorbing osteoclasts and bone forming osteoblasts. We have shown previously that osteoclasts contain gap-junctional protein connexin-43 and that a commonly used gap-junctional inhibitor, heptanol, can inhibit osteoclastic bone resorption. Since heptanol may also have some unspecific effect unrelated to gap-junctional inhibition we wanted to test the importance of gap-junctional communication to osteoclasts using a more specific inhibitor. A synthetic connexin-mimetic peptide, Gap 27, was used to evaluate the contribution of gap-junctional communication to osteoclastic bone resorption. We utilised the well-characterised pit-formation assay to study the effects of the specific gap-junctional inhibitor to the survival and activity of osteoclasts. Gap 27 caused a remarked decrease in the number of both TRAP-positive mononuclear and multinucleated rat osteoclasts cultured on bovine bone slices. The decrease in the cell survival seemed to be restricted to TRAP-positive cells, whereas the other cells of the culture model seemed unaffected. The activity of the remaining osteoclasts was found to be diminished by measuring the percentage of osteoclasts with actin rings of all TRAP-positive cells. In addition, the resorbed area in the treated cultures was greatly diminished. On the basis of these results we conclude that gap-junctional communication is essential for the action of bone resorbing osteoclasts and for proper remodelling for bone. A series of complex and co-ordinated events is required for bone remodelling [1, 2]. Osteoblasts, osteocytes and osteoclasts communicate with each other resulting in the elaborate balance of bone formation and resorption. Gap-junctional communication is well studied in the communication between neighbouring osteoblasts and between osteoblasts and osteocytes [3–8], but only little is known about the communication between osteoclasts and other bone cells. Gap-junctional protein, Connexin 43 (Cx43), has been identified between osteoclasts and overlying or neighbouring mononuclear cells [9–12]. We have recently demonstrated that bone-resorbing osteoclasts also contain gap-junctional proteins and that the blocking of gap junctions by heptanol inhibits bone resorption in vitro. In this study we investigated the effects of Gap 27 peptide in the resorption activity of osteoclasts, utilising the well-characterised pit-formation assay. Gap 27 possesses conserved sequence homology to a portion of the second extracellular loop leading into the fourth transmembrane connexin segment (amino acid sequence SRPTEKTIFII) . The Gap 27 peptide would be expected to inhibit junctions constructed of Cx32, Cx40 and Cx43, since the second extracellular loop of each these connexin isoforms contains the crucial conserved sequence SRPTEK . Although the exact mechanism of action of heptanol is unknown [15, 16], we chose to compare the functional effects of the Gap 27 peptide with those of heptanol. The procedure for the isolation and culture of osteoclasts described earlier by Boyde et al. and by Chambers et al. [17, 18] was slightly modified and has been described in detail previously . Briefly, mechanically harvested osteoclasts from the long bones of 1 or 2-day-old Sprague-Dawley rat pups were allowed to attach to sonicated bovine cortical bone slices (0.5 cm2). After 30 minutes, the non-attached cells were rinsed away, and the remaining cells on the bone slices were cultured in three groups: control, heptanol and Gap 27, described below. Each treatment group had five bone slices and each of the experiments was repeated three times with similar results obtained each time. The control group was cultured in DMEM (Dulbecco's modified Eagle's medium) buffered with 20 mM Hepes and containing 0.84 g of sodium bicarbonate/liter, 2 mM L-glutamine, 100 IU of penicillin/ml, 100 μg of streptomycin/ml and 7% heat-inactivated fetal calf serum (FCS), at +37°C (5% CO2, 95% air), which medium will be later referred to as DMEM-FCS. The heptanol group was cultured in medium with 0.15% ethanol and 3 mM heptanol in DMEM-FCS. We chose not to repeat our earlier experiments with ethanol in this study, since our previous report shows that ethanol has no effect on the parameters studied here . Third group of bone cells, Gap 27 peptide group, was cultured with Gap 27 peptide at concentration 500 μM in DMEM-FCS. In all the three groups cells were cultured for 48 hours, after which the cultures were stopped by fixing the cells and bone slices with freshly made or refrigerated 3% paraformaldehyde (PFA) and 2% sucrose in phosphate-buffered saline (PBS) for 10 minutes at room temperature. Gap 27 peptide (amino acid sequence SRPTEKTIFII) was synthesised by Keck Foundation Biotechnology Resource Laboratory, Yale University School of Medicine, USA; purity was >95%. Bone cell cultures were cultured for 48 hours with three different treatments (control, heptanol and Gap 27). After the culture period, bone slices were fixed as described earlier above. The cells were stained for tartrate-resistant acid phosphatase (TRAP), a commonly accepted marker of osteoclasts , using a Sigma TRAP kit (no. 386-A, Sigma Chemicals, St. Louis, MO) according to the manufacturer's instruction. To visualise the nuclei, the cells were incubated with the DNA-binding fluorochrome Hoechst 33258 (1 mg/ml stock diluted 1:800 in PBS, Sigma Chemical Co, St. Louis, MO) for 10 minutes at room temperature. The numbers of mononuclear and multinucleated TRAP-positive cells on each bone slice were counted, using a Nikon Eclipse 600 microscope with either a Nikon Plan Fluor 20x/0.50 or a Nikon Plan Fluor 40x/0.75 objective and a filterset UV-2E/C (DAPI) (Nikon, Tokio, Japan). The same cultures were also stained for filamentous actin (F-actin), as described before , using tetramethylrhodamine isothiocyanate (TRITC)-conjugated phalloidin (T-PHD, Sigma Chemicals, St. Louis, MO) for 20 minutes at +37°C. The cells were studied with the Nikon microscope with a Nikon filterset G-2E/C (TRITC). The percentages of active osteoclasts were determined by counting the number of osteoclasts with actin ring divided by the number of TRAP-positive cells, i.e., osteoclasts. Osteoclasts were cultured on bone slices for 48 hours in the alternative growth media, after which the resorption pits were stained and visualised as described earlier . Briefly, prior to the staining of the pits, total detachment of the cells from the bone slices was ensured by wiping the cellular surface of the slices with a soft brush. The pits were stained with peroxidase-conjugated wheat germ agglutinin-lectin (WGA; 20 μg/ml, Sigma Chemical Co., St. Louis, MO) for 20 minutes, washed with PBS, and incubated for 15 minutes in diaminobenzidine (0.5 mg/ml) + 0.03% H2O2. Morphometric analysis of the resorption pits was performed with an MCID image analyser, utilising M2 software (Imaging Research Inc., Brock University, Ontario, Canada). All statistical analyses were performed by first using one-way ANOVA test. After ANOVA indicated the groups were significantly different, Student's t-test for independent samples was performed utilizing computer program Microcal Origin version 4.00 (Microcal Software Inc., Northampton, MA). Short synthetic connexin-mimetic peptide Gap 27 is highly effective in interrupting co-operative cell-cell interactions, such as the synchronous beating of embryonic cardiomyocytes . 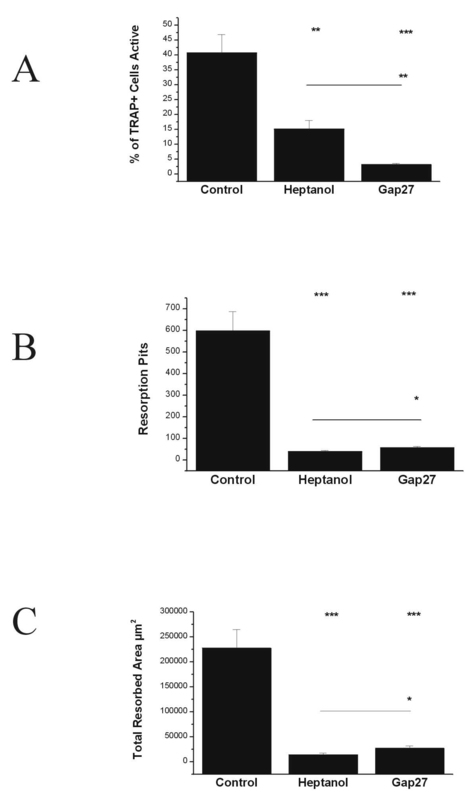 Heptanol-treated cells acted as positive controls for gap-junctional inhibition. A significant decrease could be seen in the number of both TRAP-positive mononuclear and multinucleated cells with Gap 27 compared to controls. We could see no difference in the number of other cell types present in the Gap 27 treated bone cell culture. When comparing the results from both heptanol-treated and Gap 27-treated groups, we noticed that the numbers of TRAP-positive mononuclear and multinucleated cells with both treatments were very similar (Fig. 1A and 1B). Gap 27 decreases osteoclastic survival. (A) The numbers of mononuclear and (B) multinucleated TRAP-positive cells are both decreased with Gap 27 – treatment. (C) The survival rate of osteoclasts also decreases when gap-junctional communication is blocked. Values are the means of three independent experiments. Data are expressed as means ± SEM and n = 5, representing the numbers of bone slices in each study group. *p < 0.05, **p < 0.01 and ***p < 0.001, relative to control. The survival rate of osteoclasts was determined by assuming that the number of TRAP-positive cells in each of the treatment groups was identical in the beginning of the culture. After the 48-hour incubation, the amounts of heptanol or Gap 27 – treated TRAP-positive cells were compared to the number of TRAP-positive cells in the control slices. 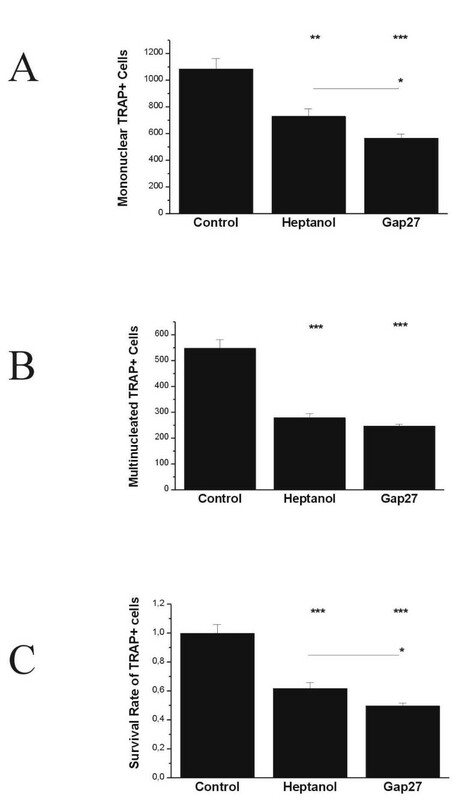 Survival of osteoclasts was clearly reduced in the groups where gap-junctional communication was blocked either by heptanol or Gap 27 (Fig. 1C). The overall appearance of the cultures was changed when either of the inhibitors were used (Fig. 2A,B,C,D,E,F). Cultures stained with TRAP stain and DNA-binding fluorochrome Hoechst 33258. The appearance of the cultures is dramatically changed when gap-junctional communication is blocked by either of the inhibitors. (A, B) Control cultures stained with TRAP-stain and Hoechst 33258 with numerous healthy-looking TRAP-positive cells with intact nuclei. (C, D) Heptanol-treated cultures as well as (E, F) Gap 27 – treated cultures have fewer TRAP-positive cells. Image width in figures 2A, C and 2E is 400 μm and in figures 2B, 2D and 2F 200 μm. The ratio of mononuclear to multinucleated TRAP-positive cells was altered in Gap 27-treated cells compared to controls. The control cultures contained approximately twice the number of mononuclear TRAP-positive cells than multinucleated TRAP-positive cells, whereas in Gap 27-treated cultures the number of mononuclear TRAP-positive cells was three times greater than that of multinucleated TRAP-positive cells. The results of the Gap 27-treated bone cells were almost identical with heptanol-treated bone cells (Fig. 3). Gap 27 changes the ratio of mononuclear and multinucleated osteoclasts. The proportional number of mononuclear TRAP+ cells is increased in cultures where gap-junctional communication is blocked. *p < 0.05, **p < 0.01 and ***p < 0.001, relative to control. To reveal whether Gap 27 has an effect on the activity of the remaining osteoclasts, we counted how many of the TRAP-positive cells of all TRAP-positive cells had actin rings, which is commonly considered as the sign of osteoclastic activity. The percentage of active osteoclasts in the Gap 27-treated cultures was dramatically decreased when compared to control osteoclasts. 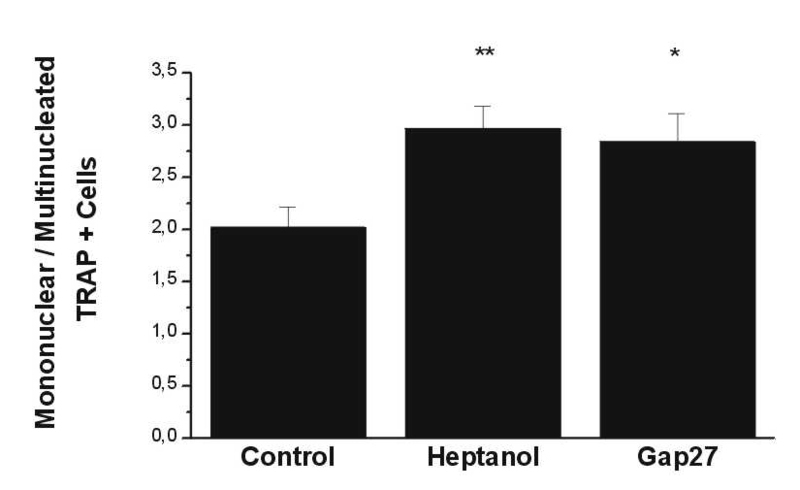 Heptanol-treated group also showed marked decrease when compared to controls (Fig. 4A). Activity of osteoclasts decreases with Gap 27. (A) The percentage of osteoclasts with actin rings, (B) number of resorption pits and (C) the total resorbed area reduce clearly with both heptanol and Gap 27. *p < 0.05, **p < 0.01 and ***p < 0.001, relative to control. To further prove that gap junctions play an important role in osteoclastic activity, we studied the effect of the peptide on the ability of osteoclasts to form resorption pits. A highly significant decrease could be seen in the number of resorption pits in the Gap 27 – treated cultures compared to the controls (Fig. 4B). In addition, the total resorbed area was greatly decreased with the inhibitor (Fig. 4C). We have demonstrated earlier that osteoclasts show Cx43 staining localising over the basolateral membrane of osteoclasts and in cell-cell contacts with mononuclear bone marrow-derived cells . It has been shown that cells lacking morphologically and physiologically recognisable gap junctions can still express Cx43 . This illustrates that connexin synthesis cannot automatically be taken as proof that a cell possesses functioning intercellular channels if it expresses connexin. Nevertheless, we have also shown that inhibition of gap-junctional communication with a commonly used gap-junctional inhibitor heptanol causes osteoclastic apoptosis and hence a decrease in the bone resorption . In this study we have demonstrated that Gap 27 peptide decreases osteoclastic survival rate. We suggest that the decrease be not due to toxicity of Gap 27 to the cells, since similar concentrations of the peptide have been used in several studies without toxic effects [13, 25, 26]. In addition, number of TRAP-negative cells in these cultures were unchanged and there was no evidence of apoptosis in this population as can be seen from Fig. 2. The decrease in the cell number seems to be specific to osteoclasts, since only the number of TRAP-positive cells is affected by the inhibitors. We can not calculate the apoptosis rate of these cultures, since most of the osteoclasts have already disappeared from the heptanol and Gap 27 – treated bone slices in the 48-hour model. As we would calculate apoptotic cells, we would actually miss those apoptotic osteoclasts that have already been detached or processed from the bone slices and thus, we would get incorrect number for the apoptosis rate. Nevertheless, the survival rate describes the survival of osteoclasts when gap-junctional communication has been blocked. The survival of both mononuclear and multinucleated osteoclasts is decreased when gap-junctional communication is blocked by either of the inhibitors, but it seems that the proportion of mononuclear TRAP-positive cells is increased in these cultures. In the absence of gap-junctional communication the multinucleated osteoclasts seem to be more prone to die than the mononuclear TRAP-positive precursors. The proportionally greater number of mononuclear TRAP-positive cells could indicate that gap junctions, in part, might be involved in the fusion of mononuclear precursors into multinucleated mature osteoclasts. The decrease in the number of TRAP-positive multinucleated cells could thus be due to disturbed differentiation or proliferation rates of these cells. Osteoclasts belong to the monocyte-macrophage cell lineage and, intriguingly, gap junctions have been shown between macrophages during the progression of multinucleation in vitro. Jones and Boyde  have also suggested the involvement of gap junctions in the fusion of osteoclast precursors to mature osteoclasts. However, we cannot exclude the possibility that the greater decrease of TRAP-positive multinucleated could also be due to detachment of the multinucleated osteoclasts from the substrate. The activity of osteoclasts drops dramatically with Gap 27-treatment. This can be seen as a decrease in the percentage of osteoclasts with actin rings, which is recurrently used as a marker of osteoclastic activity. Interestingly, Gap 27 seemed to act as even more potent inhibitor of the activity than heptanol. The reduced activity of the remaining osteoclasts might suggest that even though some TRAP-positive mononuclear and multinucleated cells are found after Gap 27-treatment in these cultures, they may already be undergoing some changes leading eventually to apoptosis and thus inactivating the cells. In addition, the resorbed area together with the number of resorption pits decreases in these cultures thus indicating a decreased activity of osteoclasts. In summary, the present data further supports our earlier finding that osteoclasts have functional gap junctions, which are important for osteoclastic function and survival. We believe, that during bone remodelling, cell contacts and junctions play an important role in modulating osteoblast and osteoclast activity, recruiting osteoblasts that transform into osteocytes and forming an open canalicular network among osteocytes. We also believe that the numerous diverse interactions of the bone-specific cells described in the literature contribute to the complex regulation of the bone remodelling [28, 29]. On the basis of these results, we conclude, that gap-junctional communication is necessary for proper bone remodelling, not only among osteoblasts, between osteoblasts and osteocytes but also between osteoclasts and the mononuclear cells of the bone marrow. I wish to thank Oulu University Scholarship Foundation and the Finnish Cultural Foundation for financial support for this study.